A traumatic brain injury changes lives forever. Because our brains are the epicenter for our entire bodies, when a TBI occurs, major functions are disrupted. These include motor skills, thinking and problem-solving abilities, and sensory processing. Some of the most concerning difficulties often faced by TBI survivors are issues with their speech and linguistic skills. It’s important to understand why these consequences occur, and what a patient can do to improve their effects. Dysarthria is one of the main reasons that traumatic brain injury survivors have difficulties with their speech. Dysarthria is considered a motor speech disorder that affects the way the muscles we use to talk move. Essentially, the muscles are weakened, which can affect the pace of speech, the volume, and the tone. It can range from mild to severe based on the case in question. When the face, lips, tongue, and throat – combined with the need for breathing – can’t keep up, it can become frustrating when a patient fails to speak as intended. But, there are ways that a TBI patient can practice and hopefully improve. A speech-language pathologist can devise a plan that will focus on muscle strengthening, breathing, and speaking clearly. It’s important for the loved ones of a TBI survivor to be supportive and patient; they may be at a greater risk for developing depression and experiencing social difficulty from their challenges with communication. Apraxia can be linked to dysarthria. Apraxia is a motor-speech disorder that affects the messages sent from your brain to the muscles needed to speak. 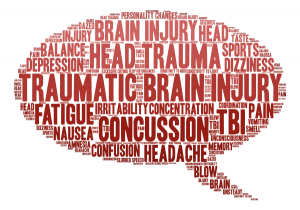 A traumatic brain injury can affect this transmission process. Apraxia is also referred to by professionals as “acquired apraxia of speech,” “verbal apraxia,” or “dyspraxia.” This disorder can prove frustrating when patients have difficulty producing the correct sounds when they speak, which can lead to the misuse of words. It can be incredibly disheartening when a patient knows what to say but can’t properly verbalize it. A speech-language pathologist can help a TBI patient improve muscle movement through exercise, improve pace and sound through speech practice, and, if the case is extreme, help them communicate in new ways. Trouble with communication can be one of the most frustrating issues a TBI victim can face. To combat the risk of falling into depression and a feeling of isolation, find a community of individuals you can talk to. That’s why TryMunity was created; it’s an entire online community for traumatic brain injury survivors and their families to connect with others experiencing similar challenges. If you or a loved one are facing the new world of life with a TBI, you’re not alone. Join today by visiting http://community.trymunity.com/.